As long as the gambling games exist there are people who tried and keep trying to "beat" the system. Well, it is possible, if you are playing blackjack or any other card game, for example. But what about roulette, slots, baccarat and so on? 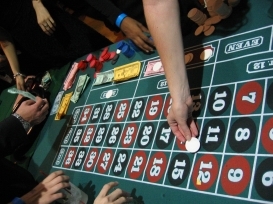 The history of the roulette systems is tightly connected with the roulette history. You might have noticed that some of the systems have some relation to mathematics. It is no wonder, as famous mathematicians also tried to find or define some patterns, systems, strategies, which they would be to apply during the game. But those, who were smarter, realized that there was no such a system and simply continued enjoying the game of chance and luck. Those who were not suffering from brilliant mind, continued searching and calculating. And those, who were keen-witted, started writing the books about the systems. That is how Martingale and Fibonacci systems were developed. Fibonacci was a simple genius of the Medieval Ages and died without knowing that somebody would be so inventive to use his numbers in betting. Roulette history keeps telling people that they cannot predict the winning number in the roulette game but they keep trying. Nowadays, as we are living in the information age, there are tons of software that offer us to learn the "best" strategies ever and play, and win, and be rich, and be so perfectly cool. Then follows the logical question: why are there so few people, who became rich by playing roulette? We doubt that there can be some explanation, except "Not their destiny". And we're not talking about the cheaters. We suppose that the smartest gambling system, strategy, style, method, scheme or whatever you call it is called "Know Where to Stop" or bankroll management. Those who do not follow this golden rule, are usually called losers. They lose everything, including their mind, transforming into gambling creatures, which can only see their lucky numbers , three sevens, or combination of Jack of spades and Ace. Roulette systems history reminds us not to use the systems for a very long time if we do not want to be brokes. Play, have fun and enjoy! Online roulette has risen to become one of the most popular online casino games since its inception in the early 1990s. There are millions of online gamblers that scour the internet every day for the best in online roulette entertainment. One of the great things about online roulette is that it offers players of all experience and skills the chance to beat the house and walk away with more money. There are different versions of online roulette, all who has their own fans. Some of the more popular versions of online roulette include French roulette, European roulette, Royale and American roulette. American roulette is not as popular as European roulette as it has an additional zero on the wheel which favors the odds of the casino considerably as opposed to European roulette that only has one zero. American roulette, however, was the first version of roulette to ever be played. These and other versions of online roulette can be enjoyed at many online casino Australia. The reason behind Royale roulette popularity is that players are offered a progressive jackpot with this game. Royale roulette jackpot is constantly growing and remains one of the biggest driving forces behind its consistent popularity. Many experts will also have different strategies and tips for you to follow to improve your chances at winning. Many players either decide to spread out their bets or taking the methodical approach. When looking for online casinos to enjoy your favorite roulette games at, you simply have to make sure that you are always playing with a legitimate online casino. This is important to ensure that you visit a safe and secure place as well as get fun and engaging online gambling experience. One of the best ways to ensure that you are indeed playing with a legitimate online casino is to research any prospective online casino you intend to play with.